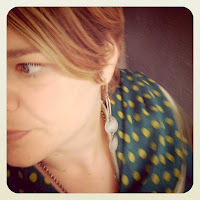 Life's Journey Requires Proper Adornment: My First Feature on a RAD blog! My First Feature on a RAD blog! I wanted to share with you this amazingness! I'm so honored to be featured on the blog madebyandi. I took the plunge and contacted Andi to see if she was interested in doing an interview with me, and what do you know, she said YES! She is a wonderful resource for creative business owners of all kinds, offering up business advice, resources for maximizing business success, and other lovely design blog goodness. This feature is 100% the result of me setting goals, and then doing the work necessary to make them happen...I've been trying to focus more on setting real, and achievable goals, putting myself "out there", and being specific about what I want. When I say I want to broaden my audience, and gain more exposure for my art, it's so important that I follow through on that and MAKE IT HAPPEN, rather than waiting around for the magic to happen...I AM THE MAGIC!!!! I wasn’t familiar with Sierra Keylin’s jewelry line before she submitted her interview to me (p.s. you can send one too, click here for details) but man oh man, am I ever a new fan. We live very far apart from each other. I’m in Alberta, Canada and she’s in Honolulu, Hawaii – TOTALLY different climates!! But through reading her interview I feel like I know her, and you will too. Her words are honest and true. She speaks passion of her work. And through her descriptions you know that each and every piece that she makes has so much love and care put in to them. It’s been my goal with this blog to share the commonality that we creatives all have in our lives, and really it’s the pursuit of being happy. It’s as simple as that. There are always bumps along the road, and Sierra is kind enough to share some of hers below, but the joy truly is in the journey and process. My favourite part is how she talks about Patti Smith’s book, Just Kids and how it really resonated with her – I’ve read that book too Sierra, and it really spoke to me as well! So, see what I mean about commonality?! Whether you’re from Canada or Hawaii or anywhere else for that matter, there’s just so much about us all that is the same. I’m sure you will also be able to relate to parts of Sierra’s journey. And it goes to show that we’re all in this together! Tell us about where you live. What’s one amazing thing about Honolulu that if we were to visit, we’d have to see? I’ve lived in Honolulu for almost 6 years now. Of all the amazingly beautiful places here, one of my favorites isWaimanalo Beach, on the East side of the island. The sand there, is like fine white powder, the ocean is bright turquoise blue, and the mountains are just on the other side of the main road…Tall, and jagged, and bright green with foliage. I love floating around in the waves there and looking back to shore at the mountains. The best part is on weekdays it’s virtually deserted, and I can let my dog run like crazy on the beach. Tell us about your business, what you make, your price range for products, and how long you’ve been doing it for. Also, are you selling full-time or part-time? What are the key ways you are currently using to make money? I sell my work exclusively through Etsy right now. 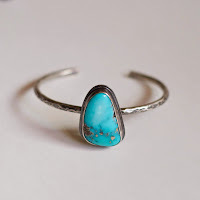 I’ve done quite a few local craft shows, markets, and trunk shows in the past, but am taking a break from that right now and trying to figure out the best way to get my work more exposure. What is your #1 source of income and why do you think that is? How have things changed for you since you started? How has your business grown and expanded? I got really serious about my Etsy shop about a year ago and started devoting a lot more time to it. It takes a lot of time to build a strong audience, and I’m still figuring out the best way to bring success to my business. I’ve made great relationships with other designers and makers. I think those connections have encouraged me and my business. As a one woman show, and on a very limited budget, I’ve been able to “open up shop” in a way that supports the unique nature of my work. Etsy has been wonderful for me, and I hope that it continues to be. What is one thing you wish you knew when you started your business? When I started I had no idea that product photography could be so challenging and gratifying at the same time… Some days I can’t get a single good shot of my new work, and other days, I’m so incredibly proud of the way the images have turned out. What is something that you still find you struggle with? Something I still struggle with is believing that I CAN do this! It is so important to maintain a positive outlook, and to believe in myself, but it’s not sunshine and rainbows everyday… There are days when I’ll ruin something I’m working on, or like I said before, my pictures are awful, and I feel like I’m just making it all up as I go along. Somethings though, that’s the best part. That I can turn this business in to anything I want. The hardest thing sometimes is just not feeling overwhelmed by all the hats you have to wear as a creative business owner. Production, design, packaging, mailing, emails, marketing, advertising, bill collecting, bill paying… But then, I’ll check my email and see that I sold something and I’ll have a HUGE smile on my face all day! And then, all that doubt, and fear is totally worth it! Did you have to deal with any naysayers in your life with regards to starting your business (people who didn’t fully support or “get” it)? I’ve been so lucky to have the most amazing supportive family. My mom and Dad have been so encouraging, they’re my biggest fans. Between my parents, my closest friends, and my partner Jo cheering me on, I always felt like I really could make this happen. They’ve often been more sure of my success than I have, as self doubt creeps in, and I question if I really have what it takes to make a business out of my craft. What are some future goals you have with regards to expanding your business? Of course I’ve been in love with the process of working with metal since my first class 5 years ago. 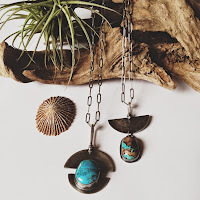 I’ve plotted, planned, designed, forged, and produced every piece of jewelry with the idea that each piece is getting me closer to the goal of being a full-time artist. I have so many dreams for my business, including making it to the mainland for some of the bigger craft shows. For the first time ever, I actually sat down to make a list of goals for the future of my business. I’d like to attend Renegade Craft Fair in LA and San Francisco, as well as the UniqueLA show next year. I love living in Hawaii, yet there aren’t those types of events here, I would love the chance to get the kind of exposure that comes with attending one of these awesome events, and see where it can take my brand. 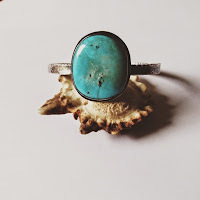 Another big dream is to do one of the smaller trade shows and really develop a core “line” of jewelry, so that in addition to the one of a kind pieces I can do some production work as well. Can you share a great biz tip with us?